I had a number of goals for 2011 some of which I have managed to achieve, others not yet, and with only 37 hours to go are unlikely to happen in 2011. Inside History , History and Genealogy 2011, Australian Family Tree Connections and also articles for Scroll, my local family history society journal. I finally started a blog 31st March then was mad enough to start four others. With 77 posts and 21 in draft (love the ability to start a post when you get the idea and then finish it later), I haven’t been as active as I had hoped only averaging 9.6 posts a month (across all blogs). I hope to do better in 2012. Lots of benefits with writing a blog including being found by new cousins! 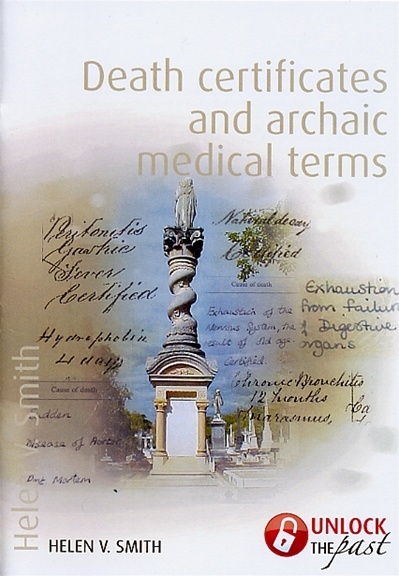 published in 2011 with Unlock the Past. It reached the top 10 of their 2011 list which was very gratifying. Thank you for your support. I have a few more books planned for 2012 publication. I love doing presentations (something about ability to “still talk under wet cement”) and have been doing them since the early 1990s . Due to work commitments (and a bout of cancer) had slowed down a bit in recent years and had only been doing them for my local FH society. I had determined that 2011was the year to restart and it has been a great year. I have done 19 presentations with Unlock the Past events : two fantastic Genealogy cruises, three Expos, Coffs Harbour, Cairns and Geelong and the New Zealand shore presentation. Then two presentations in Coffs Harbour and three for my local society. So that goal was definitely achieved with a total of 24 presentations! I have got five presentations already booked in, so far, for 2012. And I will be presenting in the Unlock the past 3rd Cruise in 2013 which will be six full sea days of glorious family history conference plus some additional talks on shore days. This is where my 2011 goals have definitely been exceeded and I have had a wonderful time doing it! I restarted my English Certificate in Genealogical Studies with the National Institute of Genealogical Studies which had been on hold due to that aforementioned diagnosis. I am just over halfway through. The plan is to finish it, then do the Australian Certificate. I have attended over 100 presentations by fantastic presenters, attending the cruises and Expos were great for this! I have also attended a number of webinars and bought copies of others that I wasn’t able to attend. I love Genealogy but 2am, my time, is not the ideal time for me! I have also devoured many podcasts especially those by the UK National Archives , Genealogy Gems, Geneabloggers, My Society also Genealogy Guys, all of which are available through iTunes. I also have subscriptions to most of the UK Family History magazines. I have not done as much of my own research as planned this year but the amount I had planned was probably an unrealistic goal. I have had some wonderful finds and further enhanced my knowledge of my family. I have spent time using the new databases available on FindMyPast (UK, IE and AUS versions), Ancestry , The Genealogist , Origins , FamilySearch and the wonderful newspaper sites Trove , PapersPast and the new British site and have found some wonderful things. It is difficult to keep up with so much becoming available online so having research plans with some free play-time scheduled in is necessary to not get overloaded. One of the major highlights of 2011 was being a member of Genealogists for Families , a group of family historians, their families and friends who have joined together to make microloans to people around the world. At $25 a loan it is making a difference to poverty one loan at a time. I have loaned to a number of people who are paying back their loans. The loans were for things like a sewing machine, a cow, a new oven for a bakery We loan because we care about families: past, present and future. 2011 has been a fantastic genealogy year! It hasn’t been such a great year otherwise with our business flooded, my property, but not thankfully, my house flooded, working full-time as a public health microbiologist and a range of other issues which has meant genealogy and the wonderful people in the genealogy community has been what has kept me sane this year! Thank you all for your support. I am working on my plans for 2012 and will post on these soon. I use tech tools to help me cite my sources in genealogy research. I use cloud computer resources to store my genealogy data [Dropbox primarialy]. I have organized and administered a DNA testing group related to my genealogy [very inactive group as am having problems persuading QUESTED males to take the test!]. I use apps involving GPS for my genealogy research. I have a Google+ account and use it regularly for genealogy. I have created and published a family history e-book. I have create a wiki related to my genealogy research. I have conducted a genealogy webinar as a presenter. I read genealogy-related blogs to help improve my own research. I have one or more genealogy-related blogs to help improve my own research [ currently have five blogs but have not been as active as I would like] . I have a Twitter account and use it regularly for genealogy [again not as often as I would like]. 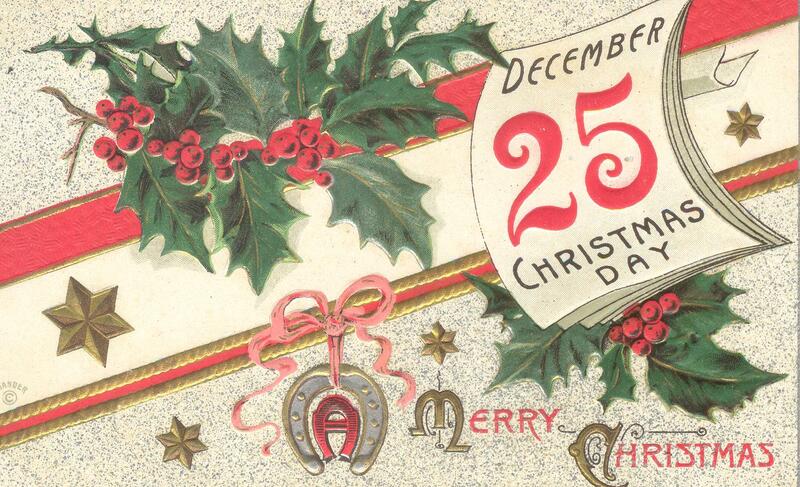 The above card is from the early 1900s and was sent from Mary Christensen in the USA to her parents in Brisbane Australia. It is very colourful and pretty. 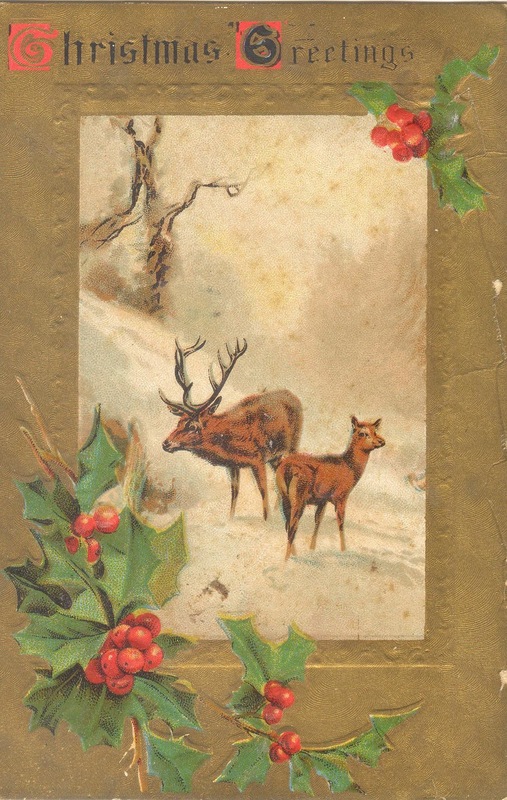 Another pretty card is this one from Lucy Rollason’s niece in London again from the early 1900s. Christmas is a time for families, for friends near and far away and for thinking of a better world. It is also a time to think and pray for our servicemen and servicewomen especially those who are far away from home and their loved ones. 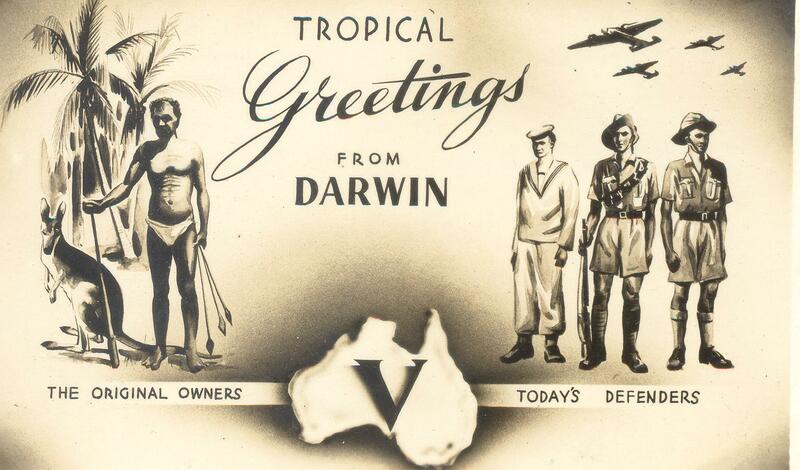 So below is the postcard sent as a Christmas Card sent from Darwin by my Grandfather William George Busby to his wife Myrtle Christmas 1941. We have arrived in Burnie after two days of conference presentations. Back to Telstra Internet about which I am very thankful! Amazing how fast it seems after trying to use the satellite Internet aboard ship. The sea was, perhaps not as smooth as it could have been, but the majority of people had no major issues apart from the presenters, who at times looked like they had imbibed the contents of the local distillery! We did our Immigration stuff and it is funny to think that I went on a tour through 13 European countries a few years ago without a single stamp in my passport yet I now have a stamp from Burnie, a town of around 20, 000 people in Tasmania. Shauna Hicks gave a presentation on the Traps and Mistakes people can make when researching. Always worth hearing again no matter how experienced a researcher you may be! Rosemary then gave a presentation on FindMyPast Australia with big news of many more records being added and the news that next year there will be a merging of the three currently separate FindMyPast offerings which will allow a single access point to your desired databases. Exact details are not available as yet but again this is something which I am very happy about as I use all three FindMyPast offerings an currently have to log in with different email addresses. Then it was off the ship to go into Burnie. Mayor Steven Kons greeted us on the wharf and welcomed us to Burnie and very nicely posed for a picture with us. He looked very elegant in his formal robes. Burnie has an excellent volunteer tour guide system who were very helpful in talking about local attractions. I visited the shopping area as had to do some business then had an enjoyable time in the Pioneer Museum. Burnie is to be congratulated on the quality of this museum. It is laid out as a street from historical times with a general store, dentist, carpenter and more. The dentist’s room did not look very inviting! The audio accompanying the room mentioned that initially there was no requirement for the dentist to be qualified and practically anybody could call themselves a dentist! It wasn’t until 1897 that a qualified dentist took up residence in Burnie to treat the teeth of the area. There was a very nice looking medicine cabinet in the corner of homoeopathic medicines. The Museum also contains a very nice area devoted to the military with displays and information from both World Wars. Burnie has a collection of Prisoner-of-War reminisces which were the result of a lifetimes work. I saw this lovely headstone near the exit and wonder about the story behind it and why it was there at that point. was it a cleared headstone from a long ago cemetery? It is in a well preserved state. A very nice Museum and a wonderful place to spend a few hours! We are now on our way across the Tasman to Burnie which is on the top of Tasmania. This means two wonderful days at sea with a full conference program. With 19 (yes that is 19!) presentations over the two days including Shauna’s and my postponed talks, it was a fantastic but very busy two days. I am not going to review all the talks there is simply not enough time but do look at some other cruisers’ blogs such as Shauna Hicks and her second blog ,Jennifer Jones and Chris Paton as they will also cover some of these. Chris Paton did a talk on Scotland Censuses 1841-1939 (yes that is 1939) and one of the most important things to remember is that Scotland is NOT England and some things were done differently, some better some not as nice for us, such as the fact the 1911 census returns available are not the actual household returns filled in by your ancestor as is available in the English and Welsh 1911 census. It is an important point and can have quite an impact on your research if you are doing Scottish research particularly as previously mentioned in doing land research. Rosemary Kopittke continued her excellent series of presentations on the online databases: FindMyPast UK , The Genealogist, Ancestry AU and MyHeritage . These were all well attended as Rosemary has a knack for showing people what is available and the best way to search the databases for the greatest returns using her searches particularly for her research name Beeston. This project has amazing potential for all future researchers and is one I am watching with major anticipation! Major announcements are expected in 2012. I look forward to supporting this project in any way I can. Richard Reid gave two more presentations: The Great Famine 1845-55 – Irish ancestral experience and memory and The Australian Imperial Force on the Western Front 1916 -1919. Richard’s presentations are full of information, much of it not so much about the records but about the life, the experience and the things that made it real to the people involved and to us. He adds colour and life to these subjects and others on which I have heard him speak. He is a professional historian and this shows through in his presentations. Again, if you have a chance, definitely go to these presentations whether or not you have ancestors involved. if you have, it will give greater meaning but this is history which has an impact on everyone. Shauna gave her postponed presentation on using Google for your Family Tree and as always gave an excellent presentation. Google is an excellent search engine and Shauna gave many tips on using it more effectively to do the searches and find the items you want. Google also has so many facets and depths apart from being a search engine. so many people don’t use it to capacity but everyone who attended this presentation should be able to go out and use it more effectively. Google images, scholar, blogs, books, translate and so much more! I gave my Researching in UK Archives from Abroad about which I received some positive comments which are always nice to hear. Chris Paton did a nice talk on DNA. Many presenters make this an overly complicated topic wanting to show you how clever they are knowing big words without showing the practical applications and problems. Most people are very happy to use a digital camera or computer without needing to know exactly how it works. DNA testing is the same, it is simply another tool which can be useful if used for the right reasons. It is not a replacement for good research. Chris showed how it could be used in real situations remembering people are real and non-paternity events do occur. Name changes also can occur for a variety of reasons which can impact on expected DNA results. It has been an amazing few days with a lot of information from the presenters and also from the cruise participants. So many people with their own research experiences and expertise. Today (well actually a few days ago but due to the restricted internet on the ship I am behind in my blogging) we cruised along Dusty Sound then into Doubtful Sound then Milford Sound. I have been to Doubtful Sound a number of years ago (originally then the plan was to visit Milford Sound but an avalanche had closed the access tunnel) during a bus tour after a conference. It was interesting this time to do it from the sea. Perry McIntyre spoke on the 19th Century Irish Landscapes which was very interesting. It is so important for anyone who is researching people, rather than just names and dates, to be aware of the geographic area of our ancestors which has an impact on their lives. Jan Gow then spoke on New Zealand BDM records online. I don’t have any New Zealand research (apart from following one Quested family that settled there and most of the work on that family has been done) but it is always interesting to hear how sites are set up. In the afternoon session I was scheduled to talk on Researching UK Archives and Shauna Hicks was scheduled to talk on Google your Family Tree. However the time the Volendam was to be in Milford Sound was the same time as our scheduled presentations. Needless to say, our talks were rescheduled as Milford Sound would obviously be the premiere attraction! And when you look at the image, could there be any doubt? I sat most of the day glued to the window watching the majestic scenery. In fact I was so busy watching that I took very few photos! I did venture on deck but it was quite cold and I returned to watch in comfort with a large cup of chai latte. We are in quite a large ship yet the steep cliffs tower over the vessel. There were some small boats cruising the Sound as well and the view from them must be awe inspiring! I didn’t see any animals but did see a number of birds. That evening we were given a wonderful presentation by Chris Paton on Scottish Weavers. Chris did a dissertation on the hand-loom weaving community in Perth, Scotland 1770-1845 as part of his Postgraduate Certificate in Genealogical Studies. The depth of knowledge and sheer passion for the subject shines through in his presentation and in the stories of the people and the records he shared. If you ever get a chance to hear Chris talk, run don’t walk for the opportunity! Then we left the Sounds on our way across the Tasman to Burnie which is on the top of Tasmania. This did mean two wonderful days at sea which means a full conference program about which more in the next entry. I can’t leave you without some comment on some things about the ship. Each night I am greeted on entry to my cabin by another towel creation. Each day the crew let us know the day by changing the mats in the lifts. Without this reminder it would be very easy to forget the day unless of course you are attending family history presentations and earnestly waiting on each new days talks!